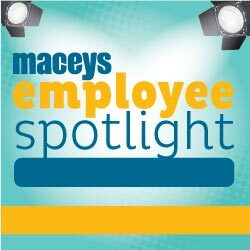 This month’s employee spotlight is on Alex Jackson, Closing Manager at the Macey’s in Providence. Alex started working at Macey’s in Providence just over three years ago. Most of his time with Macey’s has been as the meat/deli supervisor. Alex loves his job and it is evident to all that meet him. He always has a smile and is enthusiastic about everything. He likes the challenge that each day at Macey’s brings and enjoys figuring out how to adjust things based on that day’s circumstances. 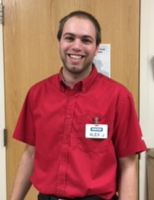 Alex offers great customer service, and those that shop at the Providence store have noticed. A while ago a lady was shopping at the store for the first time and was having a hard time finding what she needed. Alex noticed that she needed assistance and walked her through the entire store to get everything on her list. Alex also went above and beyond by talking through meal plans and other details to make her shopping easier. The guest really enjoyed her visit now visits Macey’s often. Alex’s favorite Macey’s item is the scratch-made poppy seed muffins from the bakery. “They are so delicious”, he said. The smell coming from the bakery each morning entices him to run over and buy one. If you haven’t tried Macey’s muffins, be sure to pick some up on your next shopping trip. The next time you are at Macey’s be sure to say “hi” to Alex. 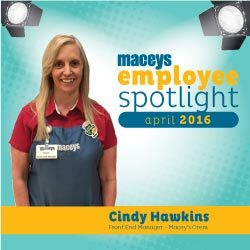 This month’s employee spotlight is on Cindy Hawkins, Front End Manager at the Macey’s in Orem. Cindy started working at Macey’s in Orem as a cashier in November 1997 since then she has worked as a Front End Supervisor, in HR and as the Front End Manager of that store for the last ten years. Cindy is happy regardless of what’s going on inside or outside of work. She is always wearing a smile and sharing a cheerful hello with both team members and guests. She truly cares about our team members and guests and wants to brighten their day. It’s always nice to see Cindy walk in the door; she brings with her a feeling of peace and calm. When big challenges arise Cindy can often be heard saying “we can do this, this will be fun”. The more inconvenient or challenging a problem may be, the greater her energy and enthusiasm. She knows how to get stuff done in a hurry, without sacrificing quality. Cindy’s favorite day is Monday because that is the day that the LDS missionaries shop. Other guests often purchase their groceries and she enjoys watching and feeling the great charity that is found in the Orem community. Cindy’s favorite Macey’s item is the fresh salsa from the produce made by Suzie each day. She said: “It is so just fresh and delicious”. If you haven’t tried it, be sure to pick some up on your next shopping trip. Cindy’s tip to shopping Macey’s: use our online grocery service, Macey’s Anywhere™. It is wonderful because you can make your shopping list during lunch be stop by and pick your groceries up on the way home. To learn more about Macey’s Anywhere and to start shopping visit maceys.com/anywhere. 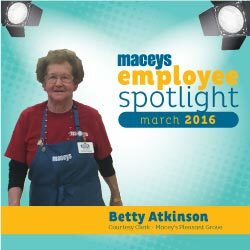 The March 2016 employee spotlight is on Betty Atkinson, a Courtesy Clerk at Macey’s in Pleasant Grove. Betty has worked at the Pleasant Grove Macey’s since the doors opened 14 years ago and she is proud to be the oldest team member at the store. She started her work at Macey’s in the service deli and then moved to a Courtesy Clerk. Betty loves her job and the interactions she has with Macey’s guests and team members. Betty knows that people like to be called by name so she has a goal to learn the names of two to three guests each week. Betty knows where to find everything in the store and wants guests know she is there to help you find things so you don’t waste your time searching. If you are shopping and can’t find something be sure to ask her or another team member; they are happy to offer assistance. Betty’s favorite Macey’s item is the Macey’s fresh salsa from the produce. She likes it so much that she goes through a 1 lb. container about every other day, so you know it must be good. If you haven’t tried it, stop in and grab some today; you’ll be sure to come back for it again and again. 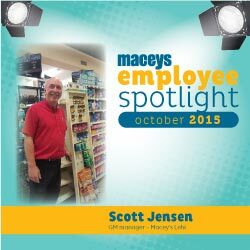 This month’s Employee Spotlight is on Scott Jensen, General Merchandise Manager at Macey’s Lehi. Scott spends his time ensuring that his areas are merchandised beautifully and items are easy to find. He’s been in his current position for only 6 months but has already made a huge difference in the store merchandising. Scott loves being a GM Manager because he is allowed a chance to be creative. Scott has been with Macey’s for three years, including two and a half years in the Receiving department. Scott came over to Macey’s from the Lin’s store in Cedar City. He feels good every day coming to work and calls Macey’s the best place he has worked. Scott enjoys helping out in different departments. You can often find him assisting with the BBQ Box smoker, smoking delicious ribs or helping out at our local Farmer’s Market. Scott wanted to push our local Utah peaches so he took some of the peaches from the Farmer’s Market and put them in the BBQ Box creating a delicious grilled peach. “There are no walls with Scott. He is always willing to help with anything that I ask. He never says no and I can always count on him to do a great job “said Dave Fisher, Store Director of Macey’s Lehi. Scotts’ favorite Macey’s item is the bakery. He loves everything in the bakery from doughnuts, to cookies to breads. He also had some very nice things to say about our new exclusive brand of ice cream, Red Button Vintage Creamery. It sounds like Scott has a bit of a sweet tooth. To make your experience at Macey’s even better, Scott recommends checking out the treasure aisle deal wall. Macey’s prides itself on providing a good value to customers. This month’s Employee Spotlight is Cordell Nielson, Assistant Store Manager at Provo Macey’s. It’s hard not to smile when you speak to Cordell. His passion for his job and joy for life shine through when he speaks. Cordell has been with Macey’s for twelve years, splitting the majority of those years between Provo and Orem Macey’s. He started on the freight crew and has worked his way up through various positions in the store. He loves his current position primarily because he likes being informed on the goings on of the store and having a plan of action. Cordell defines what Macey’s is about. He is consistent, thorough and great at training people. He is dedicated to exhausting all efforts to take care of our guests. Cordell loves many things about Macey’s but the main one is the culture and the people. The team is hard-working, engaged and friendly and he enjoys coming to work every day. He also loves interacting with the guests who shop the store. He prides himself on guests having a great and satisfying shopping experience. The experience includes anything from the check stand and items being in stock to the cleanliness of the store. Cordell doesn’t just hope guests have a great experience; he goes above and beyond to make sure they do. A guest came in last Thanksgiving to order turkeys for all of his employees as a holiday gift. Cordell worked with the meat manager to make sure they had the 200 turkeys required and at a great price. The guest did not have the means to transport all of the turkeys so Cordell created a voucher. He worked with the photo lab to create a custom voucher for each employee with their name and a holiday message for them to come in with and redeem their turkey. The system worked perfectly and all of the employees received their turkeys. Cordell’s favorite Macey’s branded item is the Macey’s potato chips. The chips are great but what he loves the most is the resalable bag. It keeps you from having to hunt for a bag clip to keep them fresh. His tip for shopping Macey’s: Double ad Monday. Monday’s at Macey’s are the days when the ads overlap and you can find some great deals. 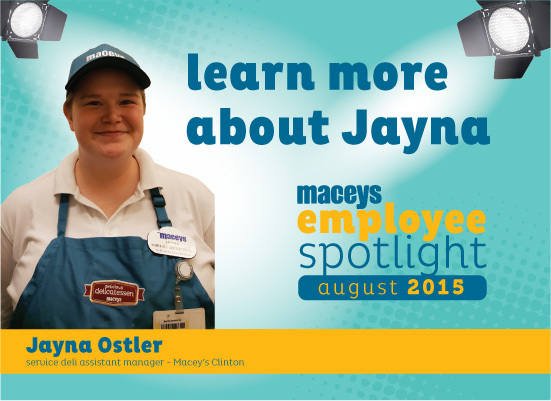 This month’s Employee Spotlight is on Jayna Ostler, Assistant Service Deli Manager at Clinton Macey’s. Jayna has been with Macey’s for two-and-a-half years. She started as a deli associate and was recently promoted to Assistant Service Deli Manager. She loves her job because it involves working with food. 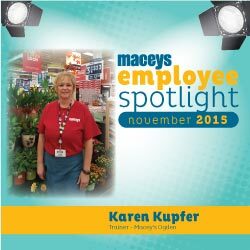 She enjoys making potato salad and sending store guests home with a delicious dinner solution that she made. Jayna is extremely dependable and always willing to help. She is very creative, great to work with and a complete asset to our store. Jayna loves her co-workers and the guests who visit the store. She especially loves seeing one family who visits the deli every day. The family comes in with a budget and Jayna helps them determine what they can purchase with that amount. She looks forward to seeing them and truly enjoys helping them get the most for their money. 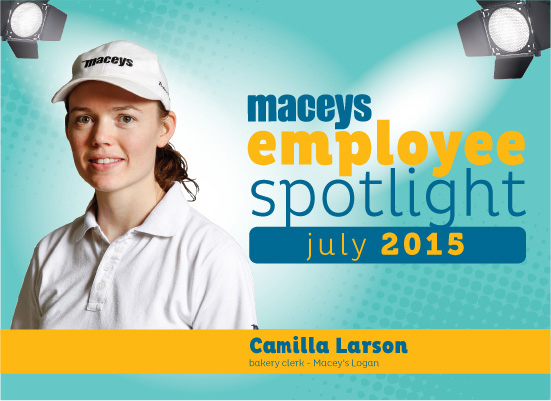 Her exceptional customer service exemplifies what Macey’s is about and doesn’t go unnoticed. She is a kind person who enjoys helping and talking to others. Jayna is more than just a deli clerk. She is an accomplished writer and has self-published three young adult novels, including editing and marketing them. She usually always has copies with her. She loves her job at Macey’s because it also allows her to pursue her writing. Jayna’s favorite item at Macey’s is the fresh salsa and she has to stop herself from buying it constantly. Her Macey’s experience tip: If you need help, don’t hesitate to ask anyone. We are always willing to help.